But US support for the election appears assured. “Peaceful and credible elections and the transfer of power to a new government will be key milestones of Haiti’s progress,” Susan Rice, US Ambassador to the United Nations, wrote in an editorial on Friday that was released amid growing alarm that the election is being stitched up for Mr. Préval’s allies. “We in the US have not put pressure on the CEP to do the right thing and uphold democratic values in Haiti – which means allowing Lavalas to partake in elections,” says Ms. Bastien, who is not an FL partisan but says all viable parties must be allowed to participate. 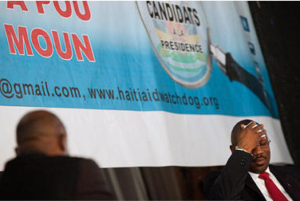 Mario Joseph, Haiti’s most prominent international human rights lawyer, holds the UN responsible for tolerating practices that compromise the fairness of the country’s elections. “They have supported this election selection, they have supported the exclusion of political parties, they have supported Mr. Préval in the choice of an electoral council without meeting with political parties,” he says. With these words, coupled to the fact that the Obama administration is ignoring all of the facts, dooms Haiti to another electoral theft that dooms the nation, once and for all. This is truly the Coup de Grace to a people that deserve more, but continually get less. During meetings with the American, Canadian, French and other ambassadors, in Haiti, the facts have been laid out. Some representatives, especially the Canadian, stood heavily against the blind support of Preval and his CEP, insisting that he modify this Preval-controlled electoral council before agreeing to releas election funding. The American representative refused to use this leverage, a leverage that would save the nation. One must look at the Obama administration to understand this criminal course of action. Hillary Clinton heads the State Department. Bill Clinton now controls the reconstruction…no matter what anyone might say. They are in the game for money and power. They have always been in the Haiti game for these two factors and have received a fortune for their support of the status quo in Haiti, rather than seek justice for the Haitian people. Rene Preval is the conduit to the money and power. With him in office there will be a ready source of funding for Hillary Clinton’s shot at the Presidency. And Bill Clinton hopes for a Nobel Prize. And the people of Haiti finally Hope for Nothing. After all, they are realists.